Pieter Bruegel the Elder, detail of “Netherlandish Proverbs,” 1559. Image courtesy Wikipedia. This afternoon my students and I were discussing some of the proverbs that are referenced in Pieter Bruegel the Elder’s complex painting Netherlandish Proverbs (1559). One student pointed out one particular detail on the wall of the house that I had never noticed before: a pair of open scissors with an eye placed above. I wasn’t familiar with a proverb or a reference to this detail in the painting, so I looked it up afterward. Giuseppe Maria Crespi, “The Courted Singer,” 1700s. Oil on canvas, 58 x 46 cm, Galleria degli Uffizi, Florence. Image courtesy the Web Gallery of Art. 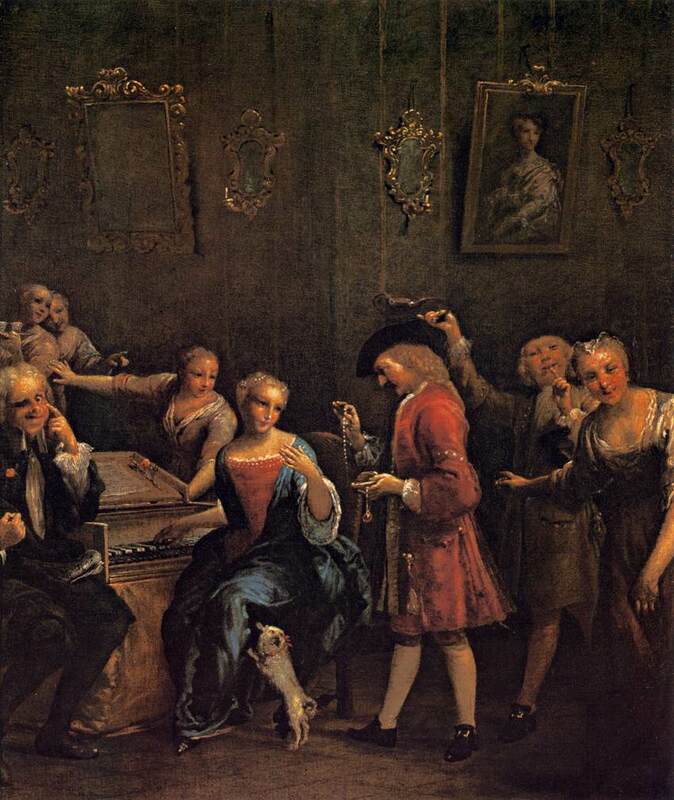 In this painting by Crespi, The Courted Singer (shown above), the winking figure of on the left reminds the viewer that the scene, which depicts a singer being courted, is not inherently gallant or noble. Instead, this singer and her affections are essentially being “bought” with the jewelry and riches offered to her. Simon Vouet, “The Fortune Teller,” c. 1618. Oil on canvas, 120 x 170 cm, National Gallery of Canada, Ottawa. Image courtesy the Web Gallery of Art. Winking was also used between characters within works of art, so that the viewer could understand when a figure was sly or involved in trickery. 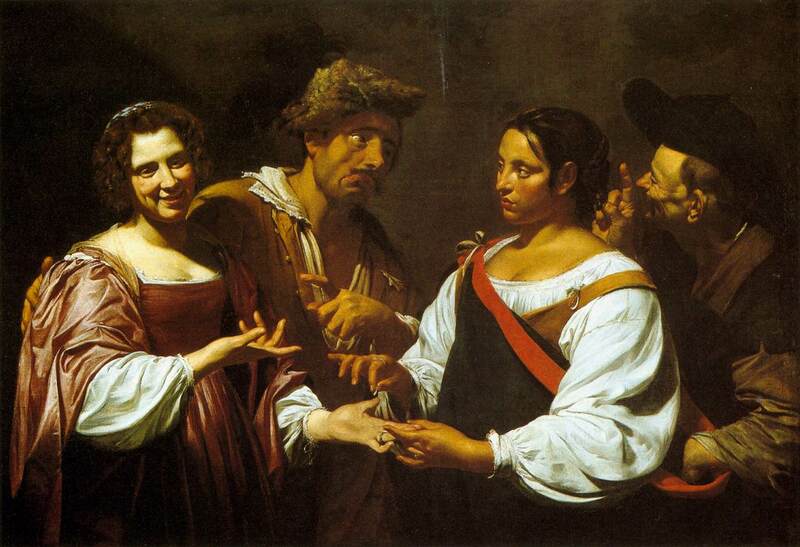 In this painting by Vouet, a man on the right of the canvas steals the purse from a gypsy woman (who is reading the palm of the woman on the far left). This thief winks to a male accomplice, who looks to me like he might be winking in return. 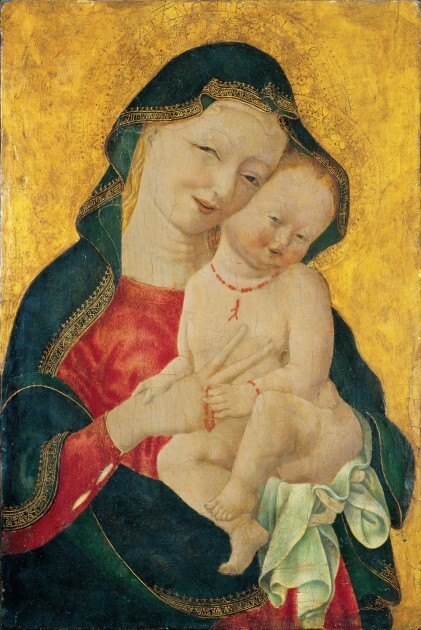 Master of the Winking Eyes, “Madonna and Child,” ca. 1450. National Museum of Women in the Arts, Washington DC. Huang Yongu’s Owl is an interesting depiction which caused a lot of controversy. Some interpreted Yongyu’s painting as a self-portrait of the artist who expressing a critique of socialism, and the painting was officially condemned as blasphemous by the Ministry of Culture in March 1974.3 The winking eye in this instance was thought by some to imply, on a basic level, a critique of the socialist system (e.g. officials were turning a blind eye to incorrect behavior). Others did not agree with this interpretation. Even Chairman Mao, who was frustrated with the extent of censorship happening at the time, said with exasperation, “An owl habitually keeps one eye open and one eye closed. 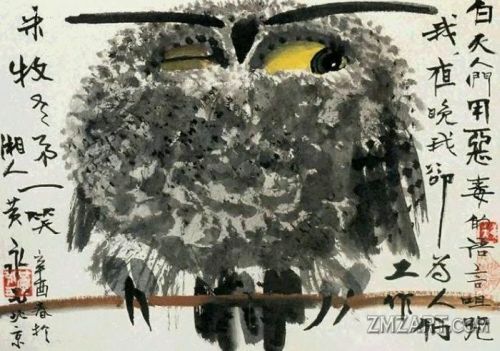 The artist does possess the common knowledge, doesn’t he?”4 Yongu created other versions of the winking owl after this 1973 fiasco, such as this 1977 version and 1978 version. Of course, to end this list, I have to include a .gif of the Nefertiti bust winking. (Since she has an unfinished eye, she does look a little like she could be winking today.) 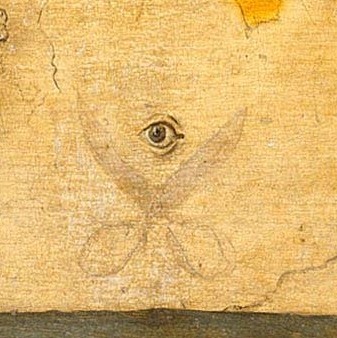 Do you know of other representations of winking in art? I’m sure there are lots of .gifs with winking works of art too, and feel free to also share those in the comments below! 1 Eric Nicholson, “Et in Arcadia the Dirty Brides,” in Transnational Mobilities in Early Modern Theater, by Professor Robert Henke and Dr. Eric Nicolson, eds (Burlington, VT: Ashgate Publishing Company, 2014, p. 99. 2 Alan Dundes, “‘How Far Does the Apple Fall from the Tree? ': Pieter Bruegel the Younger’s Netherlandish Proverbs” in The Netherlandish Proverbs: An International Symposium on the Pieter Brueg(h)els, ed., Wolfgang Mieder (Burlington: University of Vermont Press, 2004): 20. Citation also found online HERE. 3 The painting was subsequently put on display in a Black Paintings Exhibition, in order for its subversive content to be publicly shamed. Eugene W. Wang, “The Winking Owl: Visual Effect and Its Art Historical Thick Description,” in Critical Inquiry 26, no. 3 (Spring 2000): 435. Article available online HERE. This wink almost seems like a squint or a smirk (or the result of facial paralysis! ), but I think that it must be a wink since it is directed at the viewer. Ben also pointed out that Michael Fried would have a lot to say about theatricality and winking! Ha! It’s true.